The Kid and I decided to go Mexican for Friday Night Dinner a couple nights ago. We found a great new place to try and dinner was delicious. As I was sitting there eating my tequila lime chicken salad, I thought to myself that I could do this. It can’t be that hard. So I decided to give it a try. 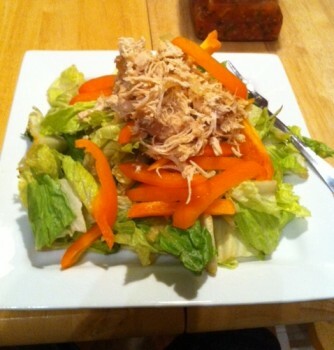 Now being the busy person that I am, I am all about easy, quick recipes that taste good. If I have to put a lot of effort into making dinner, most times I pass since it’s rare that I have that kind of time. The longest part of this recipe was the drive to the liquor store to get the tequila. If you have some already on hand, you’re set! In case you missed them, I’ve tried created a couple recipes this week that would go great as dessert for your chicken – chocolate chip cookie twins and cran-cherry cookie twins. Neither will blow your calorie budget and are fun to share with a friend. You can also enjoy both cookies without sharing if you just can’t part with one. Place chicken breasts in the bottom of a crock pot. Slice the onion and lime into rounds and place over chicken. Sprinkle garlic on top. There’s no science to this and you don’t have to be neat. I just basically tossed in the lime, onion, and garlic. Pour tequila over top. Sprinkle with rotisserie chicken seasoning or seasoning of choice. I used about a teaspoon. Put the lid on the crock pot and cook on low for 7 – 8 hours. When the chicken is done, remove the limes and toss them out. 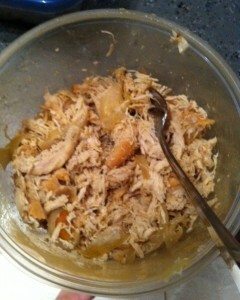 Shred the chicken with two forks and mix with the onions. Serve in tortillas for tacos, put on a salad, make burritos, and enjoy! Low fat, high taste. I sliced up an orange pepper and had a great salad with a ton of pico di gallo. It was delicious and I have a ton of leftovers for later in the week. Talk about simple. Give it a try and let me know what you think. You can get a small bottle to start with. It’s what they use in margaritas too. I found Crystal Light in margarita flavor that mixes well with the leftovers. Blend with ice and you have a relatively low cal adult drink. Walmart also has a generic version for cheap! I bet this recipe would be good with coconut rum too and maybe mango salsa for a tropical version.